The following chart was published by the Bank of England (the U.K.'s central bank) in 2011. The fact that a central bank would publish an image this honest is shocking, but what is shows is the diminishing impact of Quantitative Easing (money printing) over time. 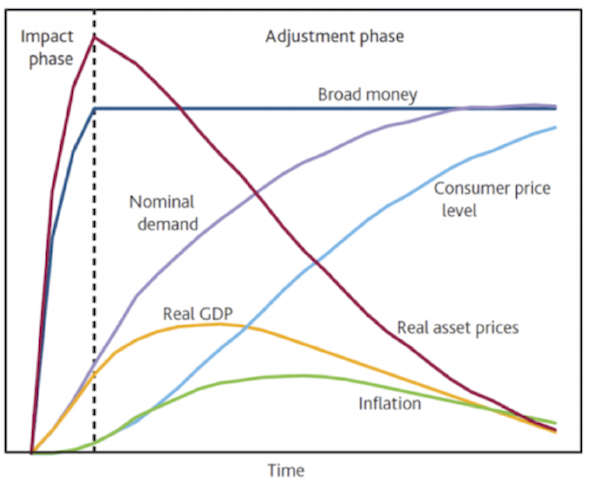 When the QE program is launched, the initial impact is dramatic with both asset prices and real GDP responding in kind. Over time you begin to move into the darker portion of the QE program where you get less (or even falling) economic improvement while consumer prices continue to rise at a faster and faster pace. This concept has been a topic of discussion recently for some of the top fund managers around the world as they have noticed that while stock, bond and real estate prices have surged higher, the underlying economy is dragging along at a sluggish zombie like pace. 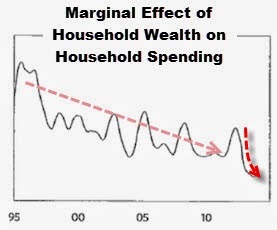 Ray Dalio, who manages the Bridgewater Associates hedge fund which became the largest in the world with over $120 billion in funds in 2011, provided the following Marginal Effect chart in his most recent letter. One of the Fed's main goals when implementing the QE program is to drive asset prices higher. This causes people to feel more wealthy and makes them more likely to spend money. If they spend money, then the economy will grow and the money will "trickle down" to the rest. This is just the theory of course which worked well during the 1990's (when Alan Greenspan first embarked on the wealth effect journey) but has steadily fallen in impact over the last 18 years. What the Bank of England and Ray Dalio did not discuss is what the impact would be should the QE program begin to be unwound. If the greatest positive impact on asset prices occurs during the initial launch of QE, would it not make sense that the greatest negative impact on asset prices would occur during the early stages of the unwind? This is why you saw markets completely rocked around the world when the Fed uttered the word "taper" back in May. Just the thought of the unwind beginning shook the financial system. This has created the vicious circle the central banks have now trapped themselves in. Understanding that they are creating asset bubbles, which are now popping up almost everywhere, they have no choice but to continue onward and just pray. One of Warren Buffett's favorite tools to measure froth in the stock market is to take U.S. GNP and divide it by the total market cap value of the Wilshire 5000 Index. This index crossed over 100% in the late 1990's market surge before reaching 150% and once again crossed over 100% in 2007. We have crossed back over the 100% danger point this year as seen in the graph below. The Shiller P/E ratio and Tobin's Q ratio are both sitting at previous secular bull market highs. 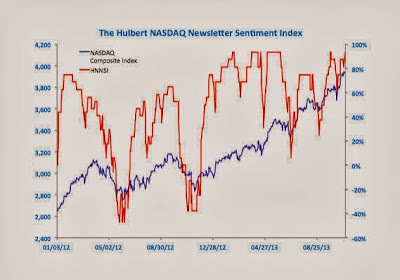 Sentiment indexes are surging as the tech heavy Hulbert NASDAQ sentiment index is at euphoric highs. Didier Sornette, author of "Why Stock Markets Crash," has spent the last few years studying chaos theory and something he calls "Dragon Kings." While a Black Swan is an event that is truly undetectable before it arrives, such as a severe weather event, he believes that a Dragon King is an event that occurs more often, is possible to predict, but still creates a mass level of chaos. One of his fields of study is the stock market. 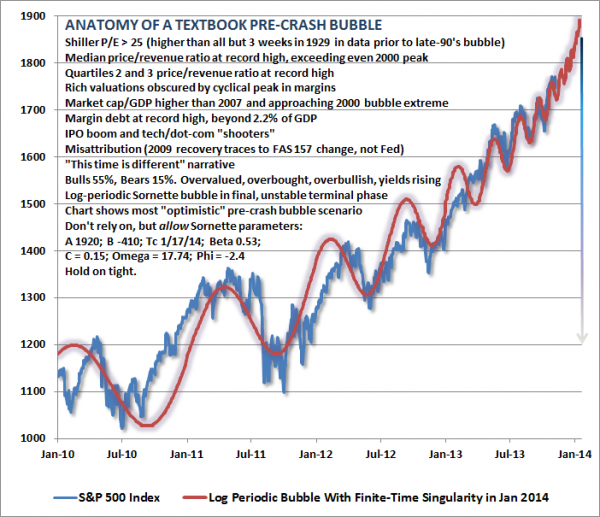 A main tool used by Sornette to determine whether a bubble and subsequent crash is upon us is to look at the wave structure of the market. A cyclical bull market begins in wide waves which can be seen in the chart below. As the market progresses the waves become tighter and tighter until they reach the point of a blow off top. While all the tinder is in place (listed to the left of the chart) for a market collapse now, the chart shows that a final blow off top could just as easily come before the crash. The blue line in the graph below shows the S&P 500 while the red line tracks a typical Dragon King event. "One of Warren Buffett's favorite tools to measure froth in the stock market is to take U.S. GNP and divide it by the total market cap value of the Wilshire 5000 Index. " Didn't you mean to say the reverse, i.e., "...take the Wilshire 5000 and divide it by the US GNP"? Also, I'm curious in the first chart, how consumer prices and inflation could diverge so dramatically. 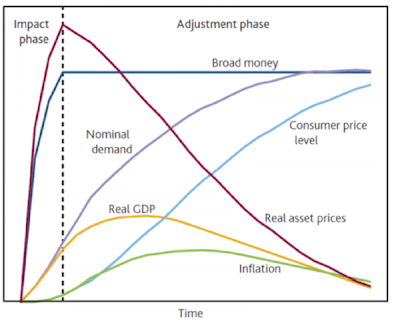 How did the central banks define inflation here? Nice article though, thank you very much.